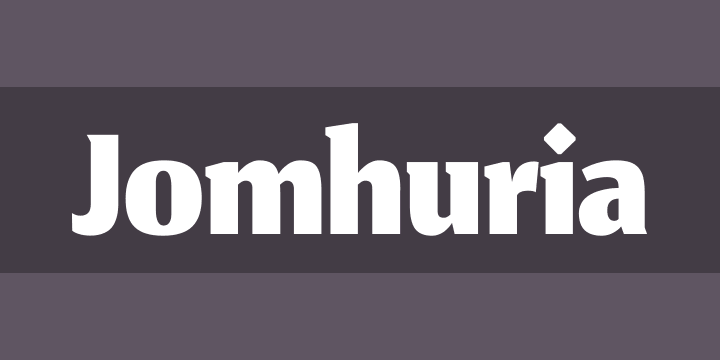 Jomhuria is a dark Persian/Arabic and Latin display typeface, suitable for a headline and other display usages. The name means ‘republic,’ and the spark of inspiration for the design was a stencil of “Shablon” showing just a limited character set just for the Persian language without any marks, vowels or Latin glyphs. Shablon was designed 30 years ago in Iran and is reinterpreted by Kourosh to incorporate contemporary techniques, aesthetics and of course some personal taste. While inspired by the spirit of Shablon, Jomhuria is a new typeface that stands on its own. Kourosh created an additional original Latin design that is tailored to harmonize with the aesthetics of the Persian/Arabic design. Being made for big sizes means details matter. The positions of the dots remain faithful to their locations in Persian/Arabic calligraphy; this is an important factor of beauty in the writing system and is key to readability.